Unprecedented attention has been directed at the confrontation provoked by three major US network airlines, the biggest in the world, as they allege the three major Gulf carriers are unfairly subsidised. And dialogues both in Washington and Brussels (and Berlin and Paris) are littered with “fair competition”, “level playing field” and any number of similar pie in the sky concepts of aviation competition. The archaicly – some say anarchically – regulated airline business has never been fair or levelly balanced. And never will be. However, the most “unfairly” treated airlines in this story are not even part of the argument…..
- yet when a handful of the world’s biggest and most profitable airlines complain so loudly that something is unfair, it’s hard to believe they are really on the losing end of this contorted business. It almost gives cause to think there is a much larger issue to be addressed than is occurring in the present "yah-boo" slanging match. That something is of course the shackles of national ownership and control – and the uniquely silly bilateral air services agreement system. But few among the combatants - at least among the haves - are serious about wanting to change that. In fact the real goal of the "fair competition" supporters is to retain the status quo. This is where Alice in Wonderland, a much loved English tale written in the 19th century, becomes so compelling. Especially when it is applied to the causes most vehemently espoused by Delta and Lufthansa, for a “fair” world. That assessment might sound a little biased; but that bias is not towards supporting or opposing anything of which the Gulf airlines are accused. Instead it could be argued – in fact it is surely an immutable argument – that the real loser at the wrong end of what is truly an unfair and unlevel playing field is: Air India and other Indian airlines. The notorious US “White Paper” doesn’t directly give away the secret, but is found clearly implying what most of the noise is about: access to Indian – mostly sixth freedom – passenger traffic. This accounts for “22% of all US-Asia bookings”, according to the White Paper. 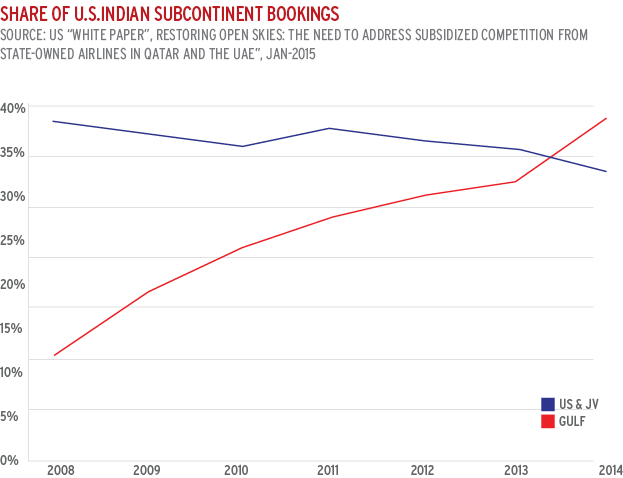 In arguing the core issues which give the Gulf carriers such an unfair advantage, the White Paper notes: “It is no coincidence that over this same period, the Gulf carriers’ share of US-Indian Subcontinent bookings more than tripled (from 12.0% to 39.8%), while US carriers and their JV partners lost nearly 800 bookings per day”. Under the “fairness” terms of the original bilateral system, all of this end to end Indian traffic actually “belongs” to India’s airlines and the airlines at the other end of each route. It took decades of foolish, misplaced Indian government protectionism to shut Air India out of being a serious international player, as sixth freedom carriage (at first most strongly opposed by Europe’s major airlines as being “unfair competition”) intervened in long-haul markets. This provided intermediate country airlines a bilateral loophole – carrying “everyone else’s traffic” over their own geographically well-placed national hubs. competition from State-owned airlines in Qatar and the UAE"
The bulk of these (potential) “losses” are in other words sixth freedom traffic carried on the metal of the big three European airlines, then funnelled into the closed trans-Atlantic JVs that are operated like a single airline. The importance of anti-trust immunised, metal neutral joint ventures on the North Atlantic cannot be understated. They are extremely valuable in allowing European and North American airlines alike the ability to provide a much better range of product. The European Commission and the US DoT have authorised them because of the resulting consumer benefits. But it is hard to believe that either US or EU authorities intended these JVs to be made bullet-proof from external competition, especially when it comes to protecting sixth freedom traffic – as the White Paper implies should be the case. This is not a North Atlantic market per se (genuine "North Atlantic" routes cannot be affected by Gulf carrier operations unless passengers are prepared to make massive backhaul detours). They actually relate to markets from beyond Europe into America. These sixth freedom traffic flows, even in the archaic regulatory structure, do not create any supposed “entitlement” in the same way as third and fourth freedom flows. They have always fair game for any intermediate airline. For the big three US airlines in these cases it is not merely a matter of solidarity in supporting their European counterparts; necessarily some of the benefits flow through to the US JV partners – but undoubtedly there is a substantial coalition of interest in opposing any threat to the status quo. If it were not so sad, the most delightful part of the “stolen” traffic syndrome (stolen from the “US carriers and their JV partners”) is that it is largely inspired by the diversion of Indian traffic over the Gulf. The one airline that has every right to feel aggrieved at the lumpy playing field is Air India. While the world’s biggest airlines squabble over what used to be Air India’s birthright (Indian source traffic), the languishing Indian flag carrier is far from being in a position to capitalise on the growing flows to the US, instead being very much out in the cold in this debate. At least Air India supposedly has the “right” in principle to compete on fair and equal terms with most of the major airlines in Asia and North America. (That is hardly an "equal" contest in itself – but such is the new world. More importantly though, Air India is locked out of the powerful Atlantic immunised joint ventures that are feeding on its national traffic. Although it is now a Star Alliance member airline, it has to sit on the sidelines as the bigger European and North American airlines privately divide up its India traffic between them, funnelling it over their European hubs. Here Alice makes another appearance: even more ironically, at least some of that traffic over the Gulf “diverted” away from the “US carriers and their JV partners” is now actually being carried by another Indian airline, Jet Airways. But it is doing that under codeshare with Etihad. To suggest that Jet Airways, an Indian airline can be stealing its “own” traffic from foreign sixth freedom airlines which have grown used to feeding on the Indian market is surely a little north of cynicism. Yet it does reinforce the obscurity of this whole Alice in Wonderland regulatory argument. The White Paper and the two big continental airlines seek a fair marketplace, a “level playing field”. Such a simple concept as “fair” should seemingly be open to objective analysis. But far from it; fairness is a highly subjective notion; and its definition oscillates. In the network of bilateral air services agreements – where “open skies” is a relatively recent development – the original use of “fair” was originally contained in the template wording that required giving all airlines a “fair and equal opportunity to operate”. This was the original “level playing field” that has since proved so elusive to pin down. What that effectively did was to handicap the more powerful airlines. Obviously, in this reading, it was considered “unfair” for the relatively massive US airlines, made powerful by access to a large home travelling market, to go head to head with a small airline from Ireland or the Netherlands, or Australia, or even the UK. The fear was US airlines would quickly have prevailed all over the world, just as so many other brands have succeeded in unregulated markets. So, fares were fixed by the government-backed airline cartel IATA, and capacity, frequency and gateway access were all fiercely controlled. And it became “fair”. The turning point in aviation regulation has been the ascendance of consumer interests. Gradually, as consumers started to gain relevance in government thinking around the world, the US began to persuade its aviation partners – with a combination of carrot and stick – to change the phrase to “fair and equal opportunity to compete”, meaning that the size handicap was gradually removed. Now the US airlines received the opportunity to compete “fairly”, while still holding the key to their domestic market. This then gave way to a variety of more liberal agreements, promoted mostly by the US, until full open skies – itself with many shades of meaning – became widely acceptable. A couple of hundred bilateral agreements (out of some 3,000), mostly involving the US, are now open skies to a greater or lesser extent. In this evolutionary process, the pre-eminence of national airline interests gradually gave way to a spectrum of other public interest priorities. Even those bilateral agreements that are not open have moved towards much greater acceptance of new foreign access, including allowing third country codeshare. Finally, as a postscript, one of the substantial beneficiaries of the superior Indian network that the Gulf airlines operate is no less than American Airlines – one of the leading proponents of the unfairness of the market. American is progressively expanding its codeshare with Etihad, on-carrying increasingly large numbers of Etihad Airways passengers domestically in the US. "Curiouser and curiouser", as Alice might have exclaimed.